Jim Cramer is currently discussing the SEC's change in the "uptick rule" for short selling. Ticker Sense and Birinyi Associates has focused on this rule change since November 15, 2007 when we first highlighted that this rule change was causing fundamental changes in market activity. We continue to agree with Mr. Cramer, although we may say that he now agrees with us. 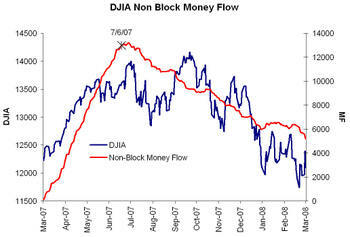 Nothing illustrates the underlying change better than the peak in Dow's non-block money flow chart. Birinyi Associates is known for its money flow analysis, which is an analysis of each transaction in a stock and shows underlying activity behind seemingly small price moves. As shown, the Dow's money flow peaked in July of 2007 and has declined ever since. Short sales that can now be executed on any trade have caused the money flows to turn and this is also a reflection of the rule's impact on market activity. 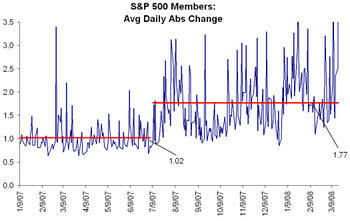 In addition to the dramatic declines in money flow, the VIX and average daily change for S&P stocks have also increased since then. Changing the uptick rule certainly did not cause the subprime meltdown, and would not have prevented a decline, but it has caused increased volatility and declines in stocks that would not have been so dramatic. In essence, short sellers are now able to sell stock that did not previously exist. While there is a buyer for the stock, essentially increasing the number of shares outstanding and offering those shares at a discount has caused stocks to fluctuate wildly. Since large amounts of capital are required to play this high-stakes game, many players have been driven out of the market. Investors have taken refuge in gold (peaked at $1,000/oz), and treasuries (10y yielding 3.31%). Investors interested in this kind of market insight well ahead of its appearance on CNBC should consider investing in one of Birinyi Associates' research products detailed here. I have been following the problem since 6 July and started a post on IBD thread on 2/12/08. The more people that recognize it and complain about it, perhaps the SEC will do something to level the playing field. It don't have to be the same "uptick", but something needs to be done as short sellers have a free license to steal from investors. I think that your organization is working only with the hedge funds rather than for the goo of the economy and the market. PLEASE REINSTATE THE UPTICK RULE FOR PUT OPTION TRADERS. "In essence, short sellers are now able to sell stock that did not previously exist"
The stuff here is normally pretty spot on and well researched but that post above is just at best naieve and at worst totally false. It works the same way only instead of waiting that extra 5-10 seconds to get a fill, you can get it immediately. On occassion when a stock is getting hammered you might have to wait a bit longer but there are hundreds of upticks in stocks each day even the ones that go down 50% in a day. Pull them up and look at them. Its penny increments. Upticks everywhere, Dowticks everywhere for that matter. The SEC studied this issue at great length and numerous papers have been written about this. Some in great depth. With the advent of decimal trading, ECN's, Dark Pools, and algorithim trading the uptick rule didn't do much anyway but with new strategies like 130/30 and portable alpha stategies it was increasingly clear that the strategies were being penalized by that archaric rule. As it was the nasdaq rule was less restrictive than the NYSE's so more volume was flowing first to Arca, then to dual listings on other exchanges. Reg NMS further complicated compliance because not every market center had the same "up tick" requirements. Hitting someone with a less restrictive policy, gives someone a potential advantage of the other person that chooses to send his order to say super dot. As to the conclusion that it has something to do with the decline. Correlation does not imply causation. Particularly the latter one in full so they understand why the change was necessary given the financial innovation that has taken place the last few years. If they changed it back the market wouldn't be any higher than it is now. Uptick rule or not the market is going to go where its going to go, it did in 2001 and it has this year as well. for that matter why a penny....maybe they should make the minimum increment a full nickle that has to be better than a cent. I say no shorting unless the stock is atleast a nickle off the low of the day. Seriously......read some of the papers the SEC commissioned on the subject, they don't go around removing reglations that old with good reason. Hmmm, have we had insanely large percentage declines on a daily baiss? weekly basis? monthly basis? No we have not. To say that removing the uptick rule has increased volatility is laughable. The simple data doesn't support it. I also find it laughable that people say they have been "fleeced" because of short selling. Hardly. They have been fleeced becasue they made poor choices by keep money in companies that took too much risk. Some things never change. Everyone wants to blame politicians (they are dirt bags for the most part), but hello - they are elected by the people and for the people. They are a reflection of us. Fat? Dumb? Greed? Incompetent? Look in the mirror, those of you complaining and see the dumb fatass saddled with debt staring back at you in the mirror. I'd also add - look at China where short selling is illegal. Their market is down 50% in 6 months. Look at the 1929-1935 period - market down 80% and there were vvvvvvvvvery few shorts. When everyone is on the same side then their is no natural buyer for the sellers (longs) to sell to. Be careful what you wish for... and don't forget to take responsibilty for yourself. no one remembers Lehman. Who killed the stock price? Who killed the bank prices. WE need the uptick rule to help the small investor. Hedge funds made billions. I hope they all fail. This blog is really nice and informative. We are pleased to know this blog is really helping people. It’s our pleasure to post informative content on this useful blog created by webmaster. We advise every investor to book profit before budget and try to grab value stocks at further decline for short to medium term. An economy consists of the realized economic system of a country or other area, the labor, capital and land resources, and the economic agents that socially paticipate in the production, exchange, distribution, and consumption of goods and services of that area. A given economy is the end result of a process that involves its technological evolution, history and social organization, as well as its geography, natural resource endowment, and ecology, as main factors. These factors give context, content, and set the conditions and parameters in which an economy functions. Today the range of fields of study exploring, registering and describing the economy or a part of it, include social sciences such as economics, as well as branches of history (economic history) or geography (economic geography). Practical fields directly related to the human activities involving production, distribution, exchange, and consumption of goods and services as a whole, range from engineering to management and business administration to applied science to finance. All kind of professions, occupations, economic agents or economic activities, contribute to the economy. Consumption, saving and investment are core variable components in the economy and determine market equilibrium. There are three main sectors of economic activity: primary, secondary and tertiary. The English words "economy" and "economics" can be traced back to the Greek words οἰκονόμος "one who manages a household" (derived from οἴκος "house", and νέμω "distribute (especially, manage)"), οἰκονομία "household management", and οἰκονομικός "of a household or family". The first recorded sense of the word "economy", found in a work possibly composed in 1440, is "the management of economic affairs", in this case, of a monastery. Economy is later recorded in more general senses including "thrift" and "administration". The most frequently used current sense, "the economic system of a country or an area", seems not to have developed until the 19th or 20th century. Nice post. I've been trying to catch up on some of the events and happenings since I landed on the island. Are you sure about Visser not getting a lot of votes. What is your footnote a reference to? The asterisk is missing from the main body of the posting. Shareinfoline.com is leading website providing you trading calls. Share Market is both for speculation & investment. First you need to find out what kind of person you are and your funds as well as risk capacity. Funds & Risk should go parallel. If you have enough founds then only you should speculate. However, you also need high risk capacity for the same. Enough Funds means you should have at least 3 lakhs Rs. 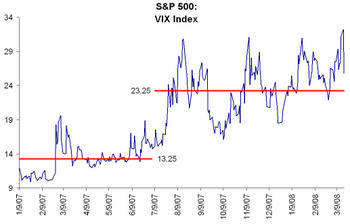 to speculate & good risk capacity to tolerate the volatility in the market. We at shareinfoline.com provide both equity & commodity tips for trading. We have good accuracy and give right guidance to our clients. Those who have limited investment, we strictly tell them not to trade (by taking our service or any one else service). They should only make safe Investment. If you want to check our trading tips then you can avail our Free Trial for 2 days by registering for it at http://shareinfoline.com/Free_Trial.asp. This blog is quite nice and informative, it is a pleasure to post a comment on this useful blog. Really E-learning stretches our education budget further with more training for the same time and effort. Just want to say- Always trade with confidence and don’t panic. Nice post. Its always better to think before investing money in stock market. Investment should be done in share market but with the aim to increase our funds so speculation should not be the mode of investment. Investors should know why they are investing money in any stock. Lot of global tensions is going on at this time. Japan is expected to pull out its money from the global market as they want to revamp their country now. In current scenario anything can happen in the Share market Investors are advised not to panic and stay invested only safe traders and investors should exit their long positions on every high and one can use every decline as an opportunity to enter market again. I am glad someone is talking about this debacle. The change of the short uptick rule was the biggest reason for our recent market downfall and volitility. I think it is the people who made the decision to change this rule who should be under investigation!!! Your blog is nice and informative. We would like to share few information’s with users. Indian stock market is not a place for speculators anymore. As it has become too volatile. Still day traders are requested to trade with strict discipline and a small suggestion for Long term players is don’t take any long term delivery position as Nifty and Sensex are still in bearish zone. Just wait for right time and opportunity before taking long position. For any doubt please feel free to ask us. Great blog nice n useful information , it is very helpful for me , I realy appreciate thanks for sharing. I would like to read more information thanks. Investing has changed in the last 5 years. It has not changed in terms of process – fundamental analysis is still the same it was 5, 10, 15, 50 years ago. What has changed is the access to information. The Web has provided investors with a whole new world of information that can be used when making investment decisions. Your blog is really meaningful and if stock market traders use this information then I am sure no one will lose money in the share market. In india Crude oil was dealing near a two-week high after the IMF brought up the international financial development prediction. However, EIA primitive oil stock predictions show a build-up in shares which is likely to cap further price profits. The development in financial strength always activated clean need for crude oil. Gold futures trading are likely to give failures current week, dropping below a one-week low moved on Wednesday, harm by a company dollars offshore, although a resurgence in physical demand ahead of key celebration could restrict the disadvantage, our experts said. The most-active gold for May month delivery on the MCX was 0.40 % lower at Rs.28, 480/ 10g, after reaching Rs.28, 445. It’s smallest since Apr 15. I read your publish . it was amazing. The way you tell about things is awesome. They are motivating and beneficial. Thanks for giving your details and opinions. Commodity gold costs in Indian, the greatest customer of gold, hovered near a two-month high on last day, maintaining investors on the side lines despite the key gold purchasing celebration of Akshaya Tritiya on yesterday, investors said. The most-active gold for June month dispatching on the MCX surrounded 0.17% lower to Rs.28653/10g but remained close to a level last seen overdue Feb, due to a sluggish rupee. thanks for this post. I especially think #1 is a great tip., This post makes a great point about focusing your efforts. stock market traders and investors. This is so cool. I am such a huge fan of their work. I really am impressed with how much you have worked to make this website so enjoyable. I am very enjoyed for this blog. It help me very much to solve some problems. Thanks a lot for sharing this with all of us. I appreciate it very much! Looking forward to another great blog! I am amar from share tips expert team. I am a technical Analyst. I like to read a lot. share market tips Play a crucial role in today’s economy; they are the key contributors towards a country’s GDP growth. India in the last decade has established itself as a powerful economy and it is growing at a healthy rate. One of the key constituents of India’s robust economy is its stock market. The stock market tips dates back to the eighteenth century. However, the real journey of the Indian Stock market began in the middle of the nineteenth century with the passing of the “Company’s Act” in 1850. The primary driving forces behind the development of the Indian Stock market were the native shares and the stock broker’s Association.